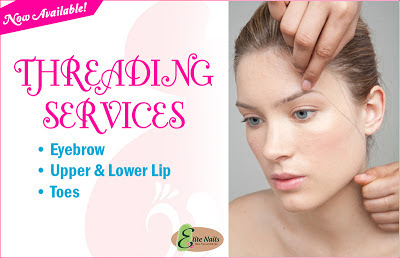 Elite Nails Hand, Foot and Body Spa: Have you tried Threading? We are happy to share with you this new service we have at Elite nails spa! Now, you can say goodbye to awful years of plucking if that is your preferred way of cleaning and trimming up your brows, Threading is the trendier switch to go! Threading gives your brows a well-defined arch that truly compliments your look any time of day. It is by far the gentlest option for hair removal on the face’s delicate skin particularly the browse, which is most-availed by women. Unlike waxing, threading is 100% natural and is much less painful because it only targets the individual hairs thus, skin irritation is kept to a minimum. Some waxing ingredients cause to have reaction on sensitive skin such as redness and irritation. That’s a no-no for us girls especially this month is the season for parties left and right and we can’t be losers hiding inside our camp for days because our face is scary red! If you’re thinking of something worthy to add to your beauty regime today, threading is a wonderful option too. Only great result comes after trying it out, common now! If you are considering trying Threading, visiting Elite Nails spa today or having your appointment booked asap should be the next thing you’ll do after reading this post. Here are the numbers to call - 09336537276, 09215918801, 09178086950 or at (02) 480-6832. Or check us out on Facebook and Twitter (@eliteNailsSpa) too.